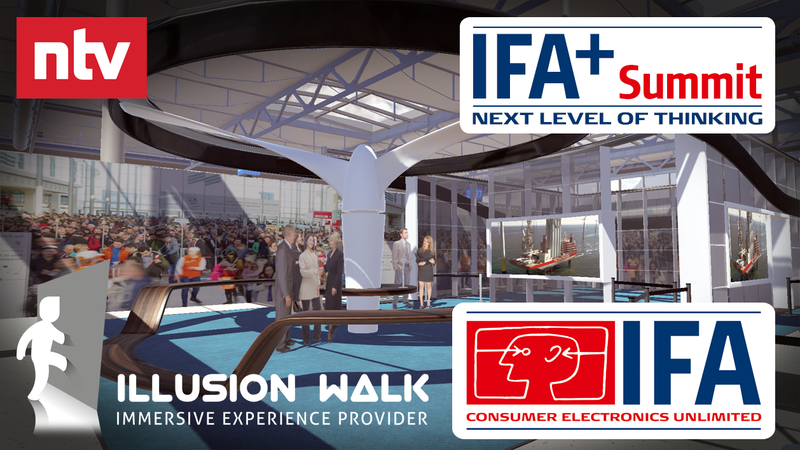 On the occasion of the IFA+ Summit 2017, Illusion Walk invites representatives of the press on September 4th & 5th, 2017 to an Immersive Exhibition: A unique virtual experience, showing you how the exhibition of tomorrow will look like. On both days, our experts will answer all your VR-related questions. If interested in experiencing an Immersive Exhibition, please sign up via press@illusion-walk.com. Showcasing one’s own company at exhibitions and conferences is crucial for businesses in all fields. Due to new possibilities in the realm of virtual reality, exhibition visits will become an outstanding and highly immersive experience. At the exhibitions of the future, it will not matter if products are too big, too heavy or too expensive for transportation. Neither will matter the choice of presenting the product in all its details or rather giving an overview of the whole. Intricacies and complex circumstances, normally hidden from the human eye, can now be made perceptible and comprehensible. VR provides the possibility to turn and flip exhibits or even configure them in real time. A unique opportunity to emotionally connect the product with the client and due to that emotionally shape the brands. Illusion Walk, a Berlin-based startup, developed a walkable virtual reality platform, the so-called “Immersive Deck”. Illusion Walk combines the latest hardware technology with novel narrative techniques to bring users the ultimate immersive experience: To walk together through large-scale virtual spaces, enjoying fantastic adventures. The Immersive Deck is a real-time holodeck based on a unique, interactive multi user concept. The “Triple-Track®” software fuses a diverse range of tracking data with high-end real-time rendering. The modular structure allows for selecting the ideal setup for many different applications – from walkable VR showrooms at exhibitions, multiplayer gaming, to virtual training scenarios.